Sniff test: Mice that carry a mutation linked to autism tend not to distinguish familiar mice from unfamiliar ones. Boosting the activity of a class of neurons that dampen brain signals eases social problems in a mouse model of autism, according to a new study1. The findings support a theory that autism stems from too much neuronal excitation in the brain. The mice carry a mutation in NLGN3 gene that is present in some people with autism. The mutant mice cannot distinguish familiar mice from unfamiliar ones, a behavior that echoes some of the social problems in people on the spectrum. This problem with social novelty stems from parvalbumin interneurons, a class of neurons that dampen brain signals, the study suggests. Pinning down the brain circuits that underlie the social problems may help researchers design treatments, says lead researcher Jian-hong Luo, professor of neurobiology at Zhejiang University in Hangzhou, China. Specifically, Luo’s team localized the effect to the prefrontal cortex — a brain region that governs short-term memory and planning. Interneurons in this brain region lack high-frequency ‘gamma’ oscillations, the researchers found. “What’s clear here is there’s something special about gamma,” says Vikaas Sohal, associate professor of psychiatry at the University of California, San Francisco, who was not involved in the study. “But we don’t know what it’s doing that’s special.” Understanding gamma’s effects could help researchers design treatments to boost these oscillations, he says. Luo and his colleagues placed the mutant mice in a cage with two chambers. In this test, one chamber holds a familiar mouse and the other a stranger. Controls spend most of their time with the unfamiliar mouse, but the mutants show no preference, the researchers found. Neurons in the medial prefrontal cortex show an increase in activity during this task. This spike is lower in the mutants than in controls, the study found. The researchers then monitored activity in the mice’s prefrontal cortex using implanted electrodes. 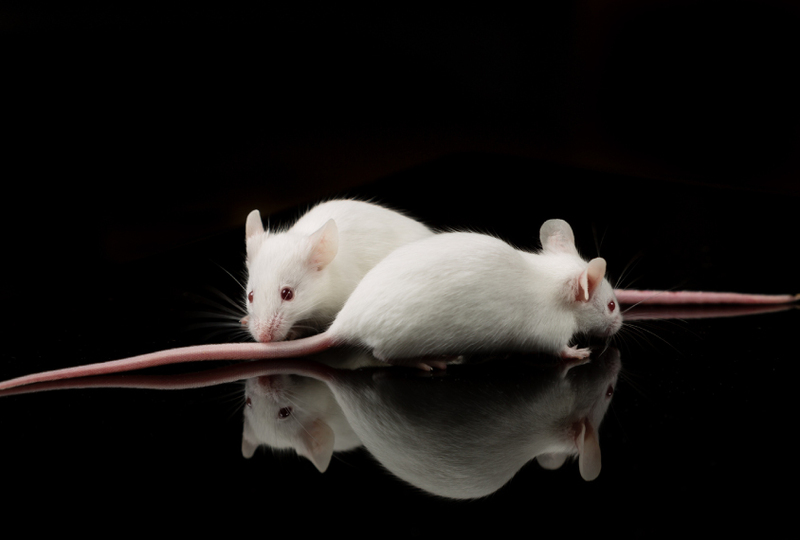 In the controls, the probes pick up bursts of synchronized neuronal activity as the mice sniff their companions. These rhythmic bursts, known as gamma oscillations, are significantly weaker in the mutant mice. This finding suggests that lackluster gamma oscillations underlie the mutant mice’s ambivalence toward social novelty, says Luo. Studies have suggested that gamma oscillations are impaired in people with autism and that disrupting them blocks mice’s social interest. To confirm this idea, the researchers used a technique called optogenetics to stimulate gamma oscillations in the mutants. They engineered the mice to carry light-sensitive proteins in parvalbumin interneurons in the prefrontal cortex. They then exposed the neurons to pulses of light. At a frequency that matches that of the gamma oscillations, the pulses of light increase the mutants’ interest in the stranger mouse. Other frequencies do not have this effect. “When you see that kind of specificity, it’s hard to argue that the pattern had nothing to do with it,” says Sohaal. What’s more, the mice’s interest in the novel mouse wanes when the researchers dampen the activity of the same neurons, using a different light-sensitive protein. The findings appeared 21 March in Neuron. The results hint that gamma oscillations underlie social motivation in mice. But it is unclear whether the oscillations themselves drive behavior or are a byproduct of neurons working together, says Christopher Moore, professor of neuroscience at Brown University in Providence, Rhode Island, who was not involved in the study. “It’s hard to imagine a topic that inspires more passionate debate than whether gamma oscillations matter for anything,” he says. However, he says, the study does suggest that social interest requires a precisely calibrated level of inhibitory activity from parvalbumin neurons in the prefrontal cortex. The results apply to only one genetic form of autism, so it’s not clear how widely applicable they would be to other forms of the condition, says Guo-li Ming, professor of neuroscience at the University of Pennsylvania, who was not involved in the study. The researchers are testing molecules that could boost the activity of parvalbumin interneurons in the mice. They also plan to repeat their experiments in mice missing the autism genes SHANK3 or FMR1.